I got my beagle from a beagle rescue, so I don't know too much about her background and medical history. I do know that she had a litter of pups and she had not been spayed. When my family got her she was about 5 years old, but that is just an approximation. After getting her we called our former veterinarian who said they didn't feel comfortable with spaying her because of her age. I also contacted our local humane society and they said the same thing. They said that at that age the procedure becomes too risky and a lot of times the dog doesn't survive. I don't know if this is accurate, but since this is what we were told we didn't get her spayed. She has gone into heat twice a year and the most recent one was in September/October. 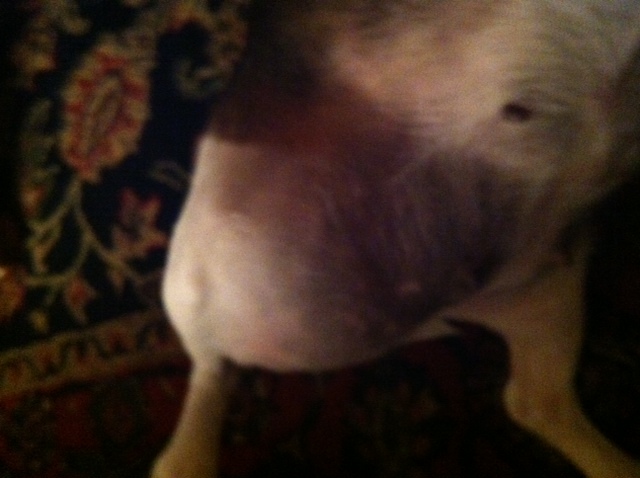 I am concerned because it appears that her inner rear right leg has become largely inflamed and is very swollen. It almost appears as though her organs have slid. She isn't in pain and lets you touch her without any hesitation. She is still active and has a healthy appetite. Any idea what this could be or how we should proceed? Based on what we have been told before, I am afraid to take her in and have her operated on, for fear she won't survive. Thank you for your help. Interesting. I would never say that a dog is too old to spay unless she had age related issues like kidney or liver problems. In my opinion, if a dog's blood tests are normal then I am quite comfortable doing a spay. I'm quite concerned by what you have described. Is there any way that you could take a picture of the swelling on her leg? If so, you can email the photo to photos@askavetquestion.com. I can think of a few possibilities. One is that this is something called an inguinal hernia. This happens where the muscles in the groin weaken and some of the intestines can pouch out underneath the skin. If this is what she has then only surgery can fix it. It's not a painful condition but if it goes unfixed then it can be serious if the intestines get injured or get trapped or twisted. The next possibility is that this is some kind of tumor. It could be a mammary tumor. Half of all mammary tumors are benign and half are malignant (i.e. cancerous). If this area is red and inflamed then I am concerned that it could be a cancerous tumor. Unfortunately mammary cancers are quite common in dogs who are not spayed. It's also possible that this is something really non threatening like a fat lump called a lipoma. However, a lipoma should not be inflamed. It's also possible that this is some kind of an abscess. If so, she'll need antibiotics prescribed by the vet. Some abscesses need surgery in order to heal. It does sound like you should have your vet take a look. Thank you very much for your response, it is very much appreciated. I have forwarded a photo to the photos@askavetquestion.com. Thank you again. It's hard to say too much from looking at the photo as it is a little unclear. What I can say, is that I am concerned by what I am seeing. I don't like the fact that it is so purple. This concerns me that there is some bleeding under the skin or severe bruising. I would highly advise that you have your vet look at this!